This is a novel full of spiritual wisdom. It charts the relationship between a white American, living in the state of Georgia, and a North American Indian hermit called Keechie. Although there are some interesting parallels with the work of Carlos Casteneda, Keechie is not at all like the cantankerous Mexican shaman Don Juan. She is gentle and vulnerable, protected by a powerful spirit guide called Puma Man. Her story is initially one of loss and loneliness, yet becomes warm, even moving. Through her new friend's growing understanding of the world, and Keechie's part in it, she becomes reunited with her tribe. She sets about reinvigorating her estranged and forgotten people with the spiritual and practical knowledge of her forefathers. Phil Whitley writes with great affection about the rituals and wisdom of the indigenous peoples of North America. The book is also allegorical, reflecting the lost wisdom and decimation of North America culture. It reflects on how the knowledge of the native American Indians was closely linked to their environment, and how that spiritual wisdom can be regained by the present populations, if only they could engage with the natural world around them. Phil Whitley prophesies that modern society stands on the precipice of catastrophe, in the form of terrorism and pandemic disease. 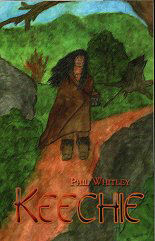 His answer is to escape to the hills and learn the ways of the ancients by living off the land in natural harmony. Yet his writing is practical too; this is not an idealistic dream of the simple life, but a guidebook to its pitfalls and dangers. The rewards to be gained are evident, in the form of self-awareness and spiritual growth. I can quite see why Americans, disenchanted with the current direction their nation has taken, and fearing for the future, would find succour in the ways of the ancients. Perhaps, as the world's oil stocks crash towards the floor, we shall all have to re-discover our own ability to work with nature; growing our own food, trading locally, making wider use of horses once again, that kind of thing. But I doubt the need to completely go 'survivalist'. Perhaps that difference in point of view is more to do with geographical location (the over-populated English midlands versus the expanse of the American South) than realism about the problems we face. Or it may be that Europe has survived worse disasters than this current spate of terrorist threats, and come through them. Our history is different over here, perhaps giving us greater optimism that Western civilisation can weather the current storm. Either way, 'Keechie' teaches us about the basic things in life we don't know, have forgotten or are simply completely ignorant of. By the end of the book our alienation from nature is very much apparent. The book offers us a vision of the danger our society's collective disinterest in nature and spirituality is placing us in: It's up to each of us to re-learn the old ways for the sake of our families and children. And Phil Whitley has evidently been thinking this through for a while...This is a well-researched and delightful book which deserves to be widely read and pondered upon.